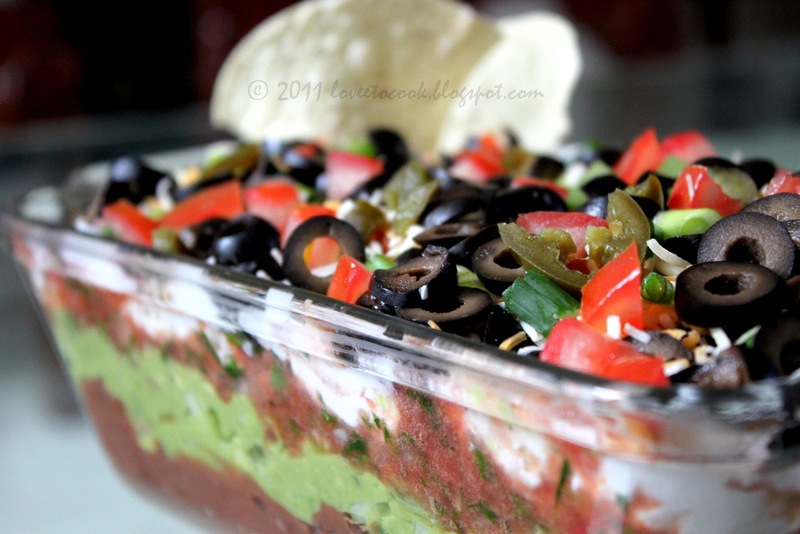 Eating the seven layer dip has become a tradition in our house every super bowl . And truly,the energy surrounding the big game demands a tantalizing tackle for the tongue, every touchdown! You may or may not be lucky to find your favorite team huddled up on your big screen this super bowl, but you will definitely find your friends and family huddled around this platter of awesomeness always! Remove refried beans from the can and microwave for 40 seconds. Add taco seasoning or cumin powder and mix well. Take a deep bowl or platter, and layer to your fancy starting with refried beans at the bottom. You can add a layer of Guacamole next , followed by pico de gallo/chopped tomatoes. Next add a layer of whipped sour cream, followed by a layer of grated cheese and next some tomato Salsa . Finish with a mix of olives, jalapenos, chives and tomatoes on top. Sprinkle some grated cheese again. Do not broil as i see many doing the same, maintain the fresh raw taste. Great recipe, I love when a dip has salsa and guacamole in it. So nice. And you didn't use cream cheese that is awesome for those of us who can't eat it, thanks so much.